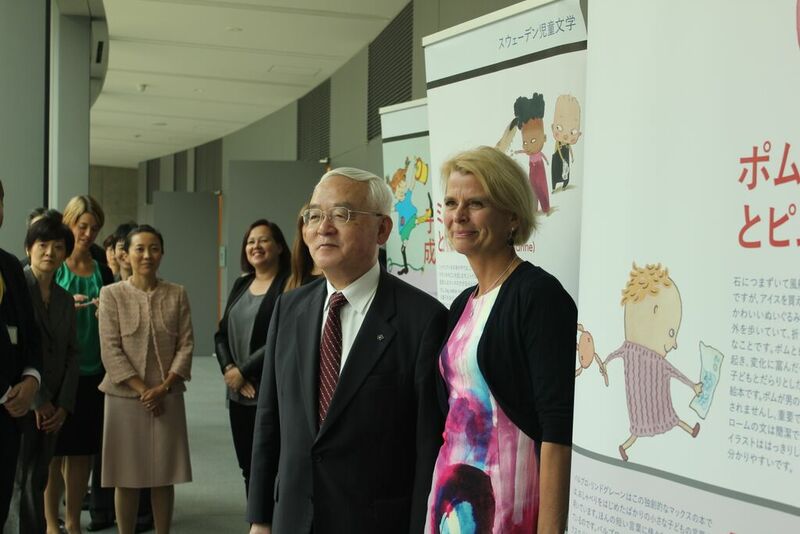 In connection with the Pippi Lockstocking celebrations this year, the Swedish Embassy in Tokyo have conducted various activities related to children’s literature and culture, in co-operation with the Swedish Institute. 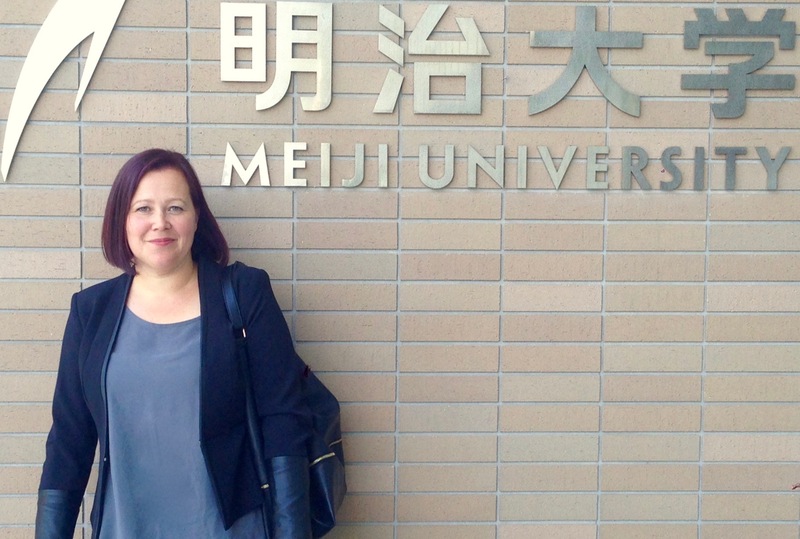 Last week ALMA jury member Elina Druker gave a lecture on Swedish children’s literature at two of the leading universities in Tokyo, Meiji University and City University. 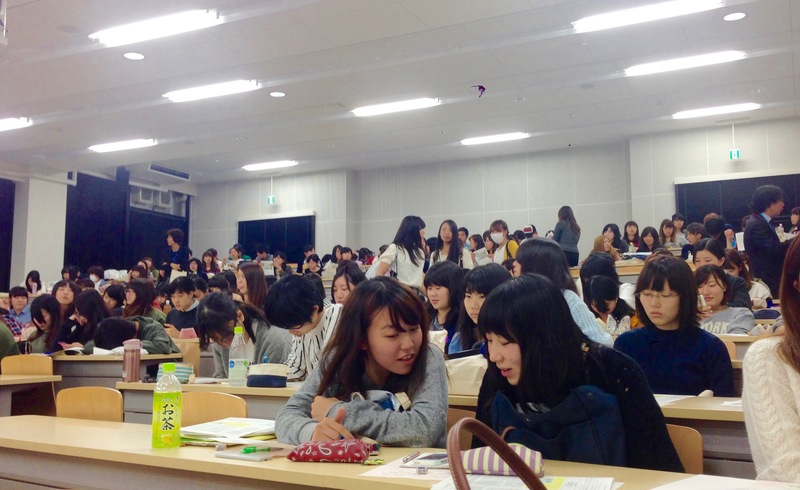 A well-attended seminar “Room for Kids” was held at the International Children’s Library in Ueno on October 15th. 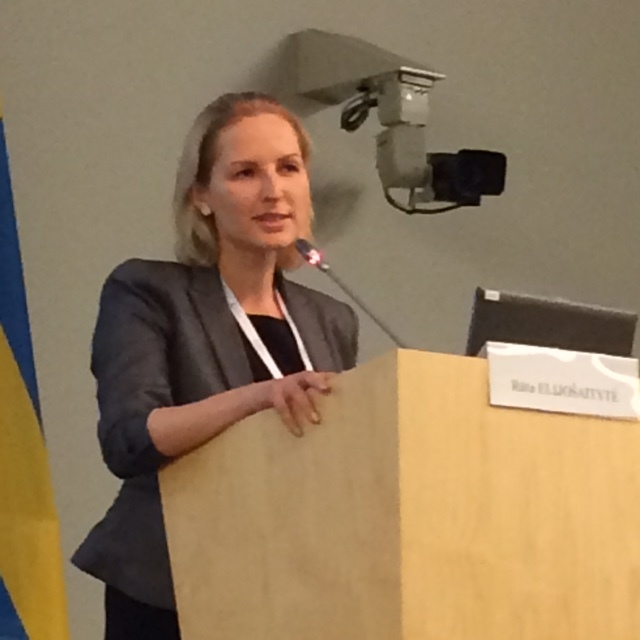 The seminar was opened by Åsa Regnér, Swedish Minister for Children, the Elderly and Gender Equality. 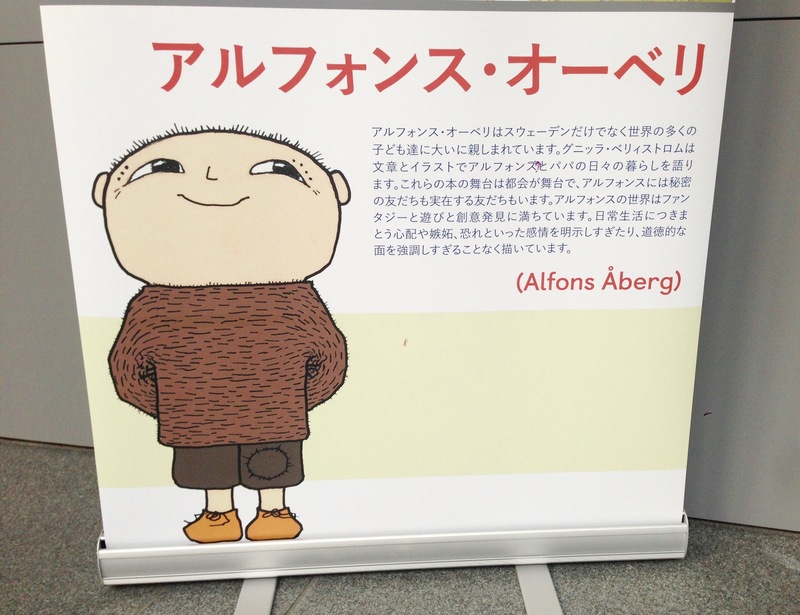 Other participants were among others, film director Goro Miyazaki, in the news limelight with his animated television series Ronja the Robbers Daughter by Astrid Lindgren, picture book artist Jonna Björnstjerna, whose books about the wonderful family Rabbit has recently been translated into Japanese and author Takako Sato. 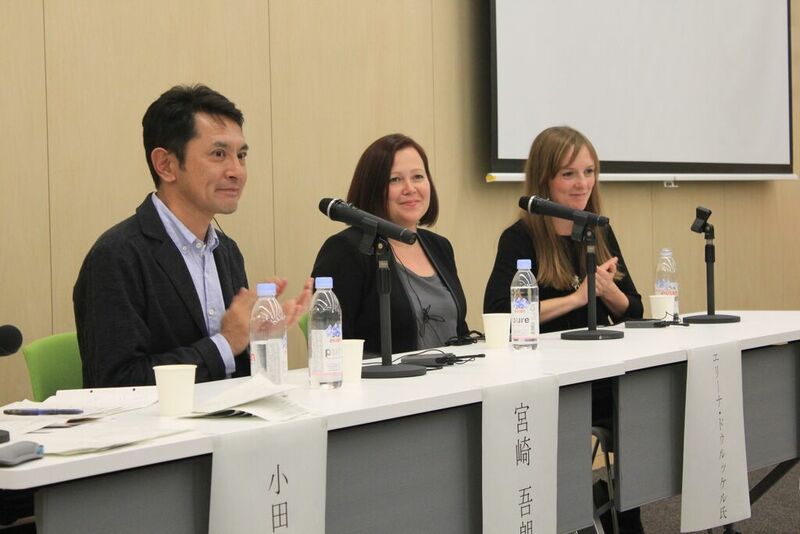 Goro Miyazaki, Elina Druker and Jonna Björnstjerna. 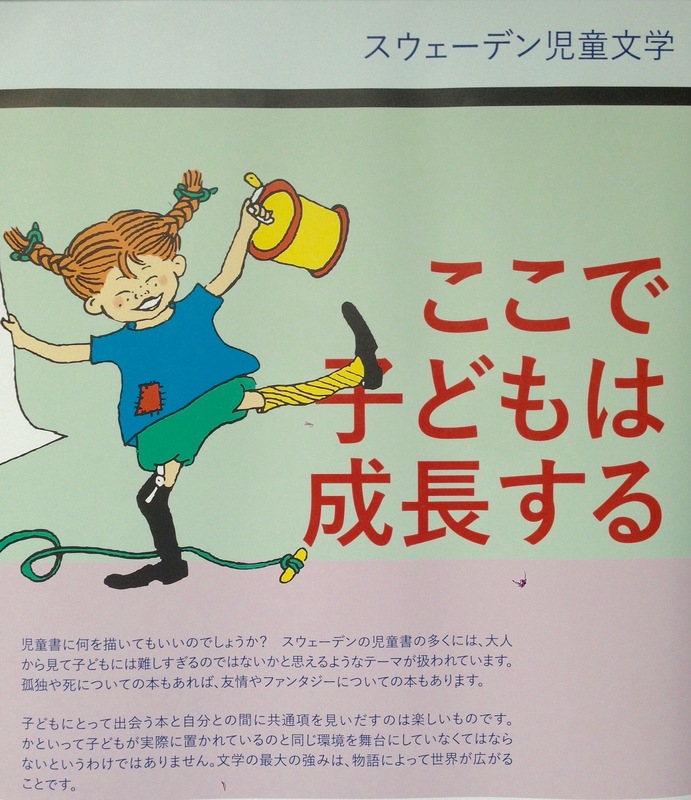 Haruko Hashimoto talked about her work with the project Tohoku Charity Film Screening which have given screenings of Astrid Lindgren’s “Saltkråkan” in areas affected by earthquakes and tsunamis in Japan. The moderator, journalist Maiko Oda from magazine Nikkei DUAL, eventually led a discussion with Jonna Björnstjerna, Goro Miyazaki and Elina Druker about children’s literature in Sweden and Japan, the importance of Astrid Lindgren and how children’s reading has developed and changed in the two countries. 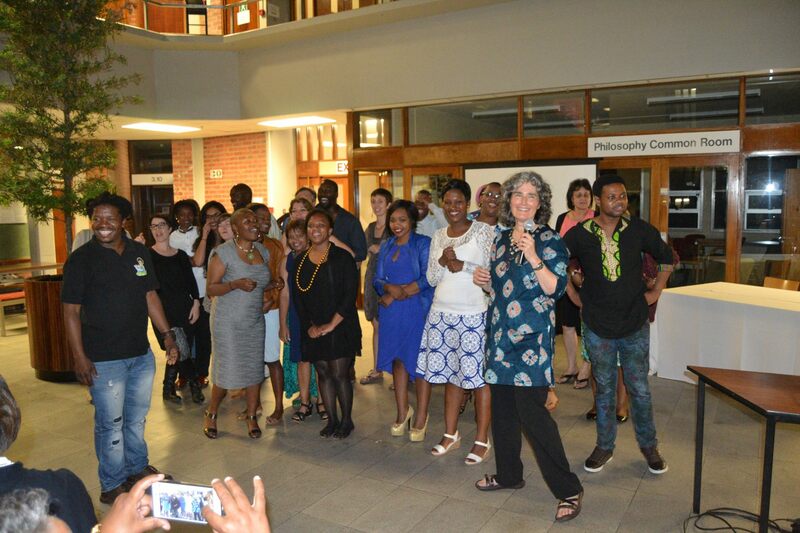 Celebrating its recent status as 2015 laureate of the world’s largest award for children’s literature and reading promotion, the Astrid Lindgren Memorial Award, staff members, friends and associates of PRAESA (The Project for the Study of Alternative Education in South Africa), gathered in the Neville Alexander Building at the University of Cape Town on Friday 09 October for an evening of entertainment. 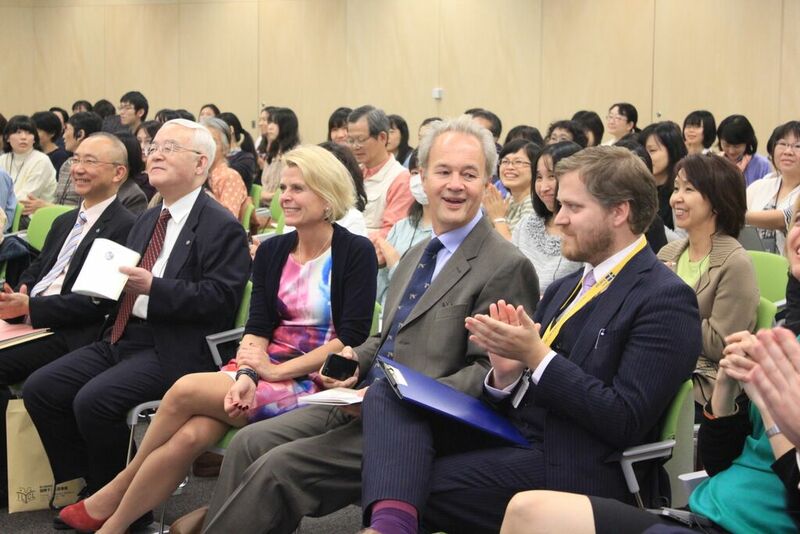 Director of PRAESA, Carole Bloch, explained how fitting it was to host this celebration of PRAESA’s work in a building recently named after PRAESA founder and director till 2011, Neville Alexander. 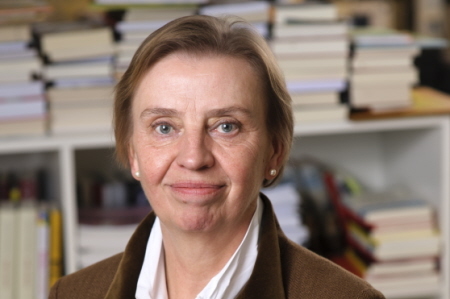 Sharing the speech she made earlier this year in Stockholm when she collected the award, Bloch highlighted the significance of PRAESA’s work since 1992 in the research and development of multilingual literature and holistic story-based learning approaches. 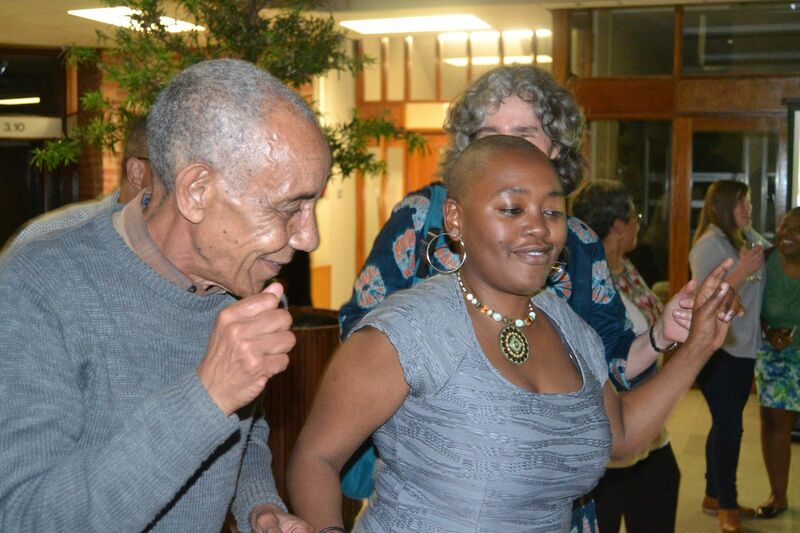 “Neville Alexander argued consistently for the necessity of using African languages as a democratic imperative in South Africa and played an inspiring role in the ongoing struggle for equality and against racism and other forms of prejudice in South Africa,” said Bloch. 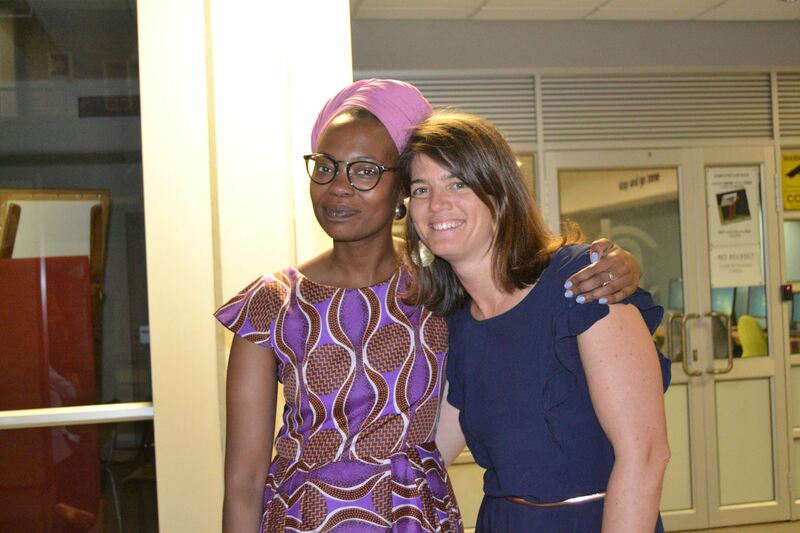 Alexander offered Bloch a welcome home in PRAESA to develop, with colleagues, her ideas of how to transform early literacy teaching and learning approaches and the PRAESA team has played a catalytic role in its work to develop African languages and support multilingual education. 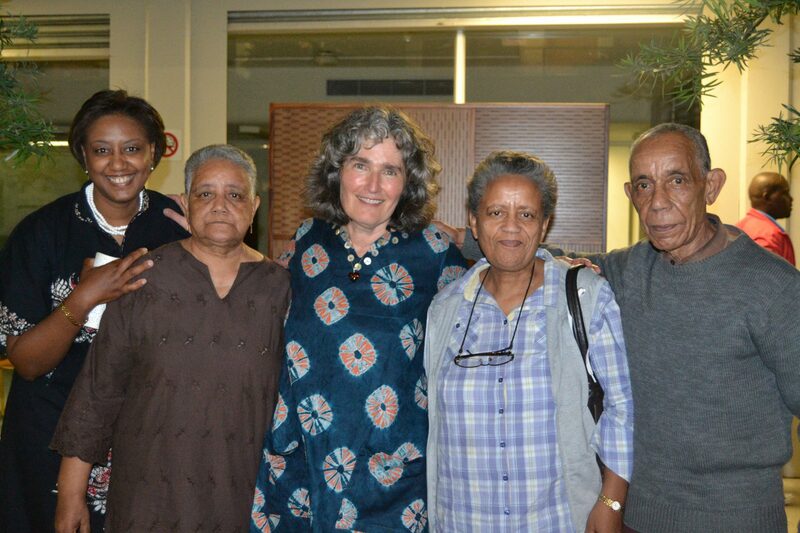 Most recently, PRAESA’s work has been taken to scale in the Nal’ibali reading-for-enjoyment campaign, and the event brought members of the Nal’ibali team from across six provinces together to celebrate. 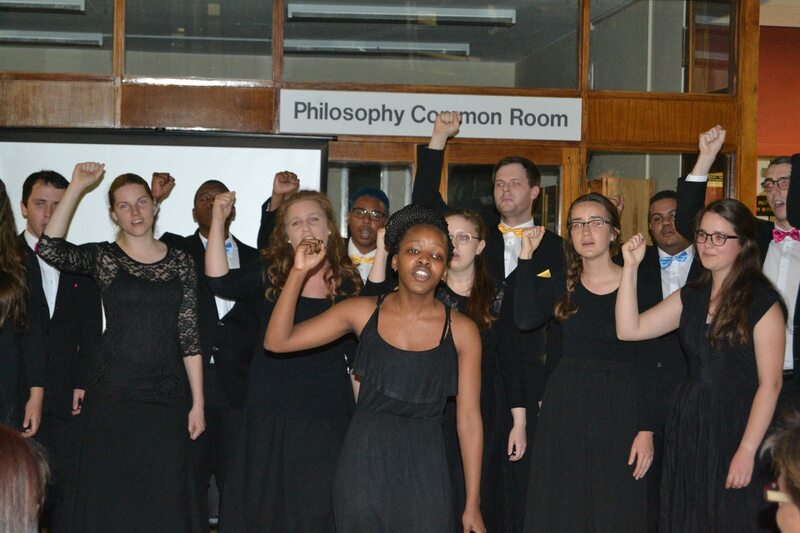 Joined by many friends and colleagues of PRAESA, including Alexander’s immediate family, the group were entertained by the beautiful singing of the Cape Town Youth Choir; hip-hop pioneer, Emile YX?’s mixed mense music as well as messages and singing from members of Nal’ibali. Carole Bloch surrounded by Neville Alexander’s brother and sisters. 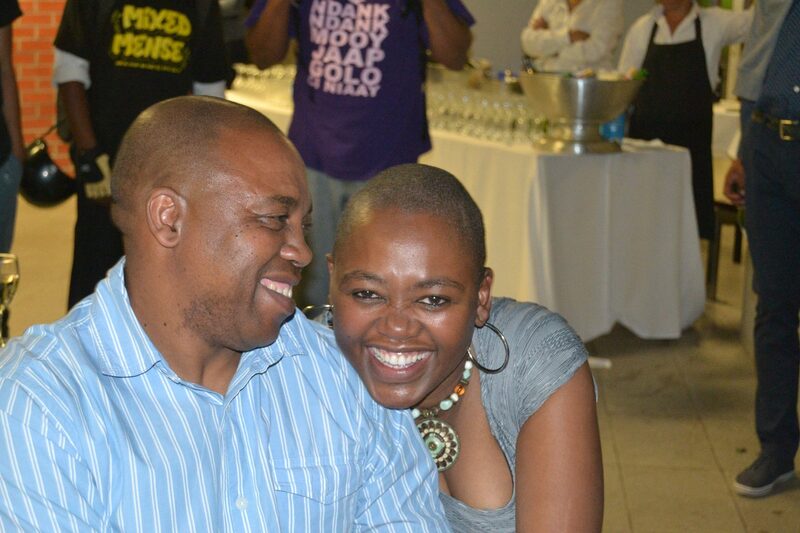 Ntombizanele Mahobe, Training Coordinator for the Nal’ibali reading-for-enjoyment Campaign and Neville Alexander’s brother. 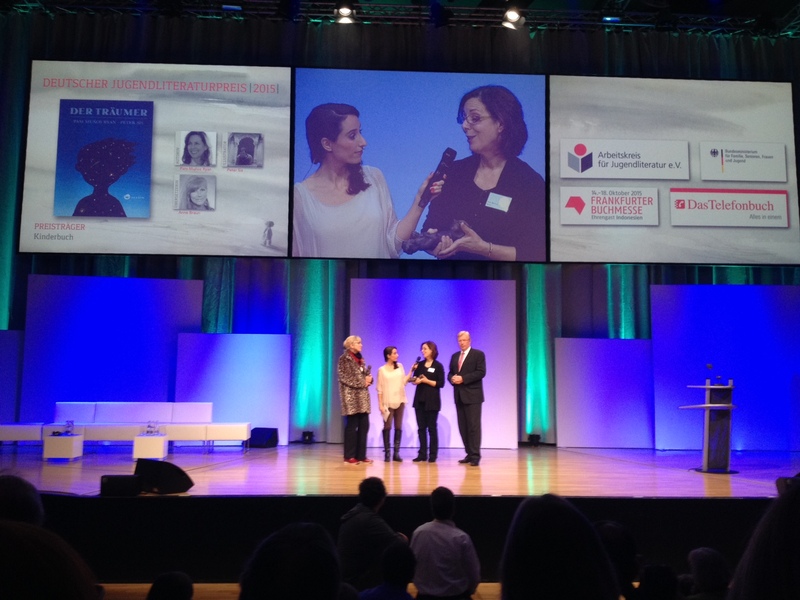 Yesterday night we took the chance to celebrate the winners of the German Children’s Literature Award – the Deutscher Jugendliteraturpreis. The ceremony took as usual place at the book fair’s Congress Hall. 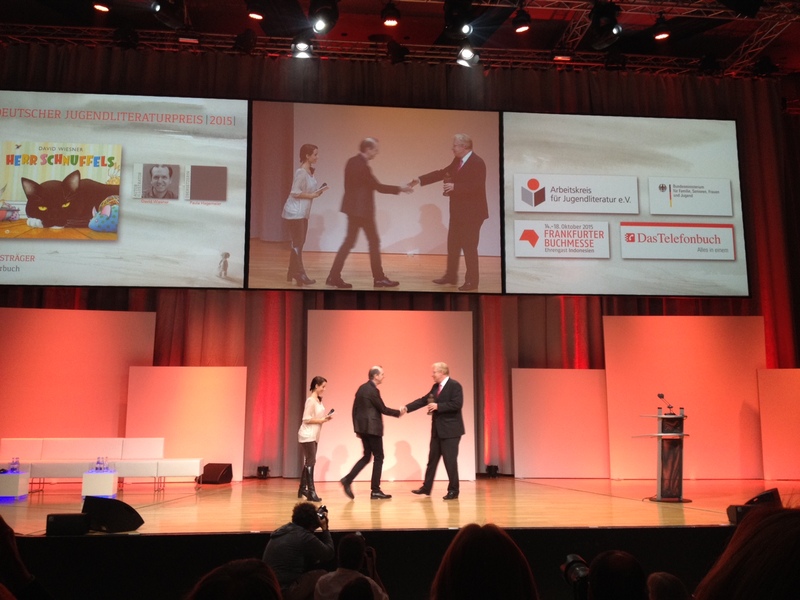 29 books from 20 publishing houses were nominated, among them Eike Schönfeld who translated artist and 2011 ALMA laureate Shaun Tan’s Rules of summer in the picture book category. Vivian Perkovic guided the audience with lots of humour through the program. 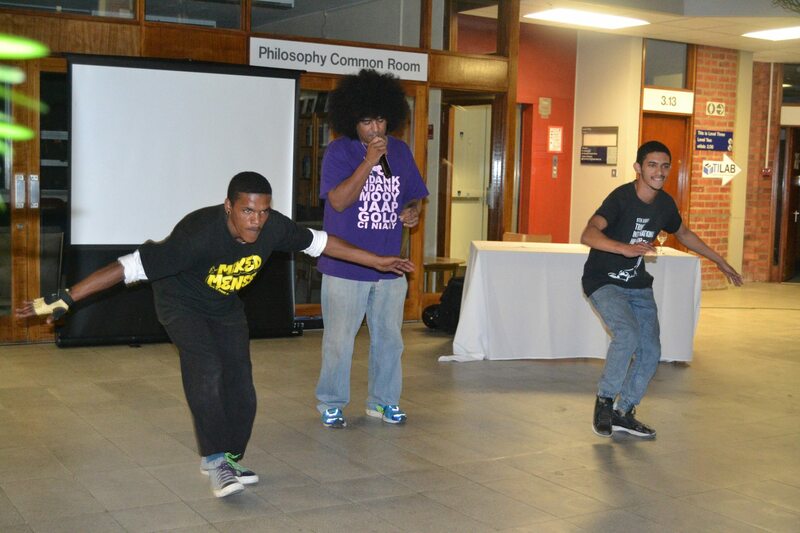 Children acting from parts frombooks by nominees. All laureates are presented here! 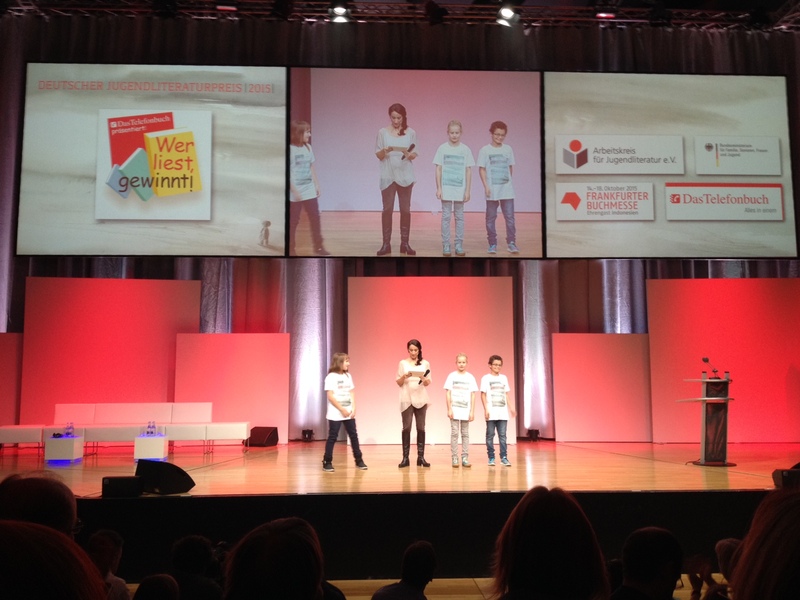 Next year 215 candidates from 59 countries will be in the running for the world’s largest children’s literature award, jury chair Boel Westin announced at the Frankfurt Book Fair today. A total of 111 nominating bodies worldwide proposed candidates for the 2016 award. Many chose to re-nominate previous candidates, but this year’s list also includes 42 new names. New nominating countries for this year are China, Nicaragua, Palestine, Austria, and the United Arab Emirates. The complete list of nominees is online at www.alma.se. The laureate or laureates of the 2016 Astrid Lindgren Memorial Award will be announced in Stockholm and Bologna immediately following the jury’s final meeting on April 5 of next year. 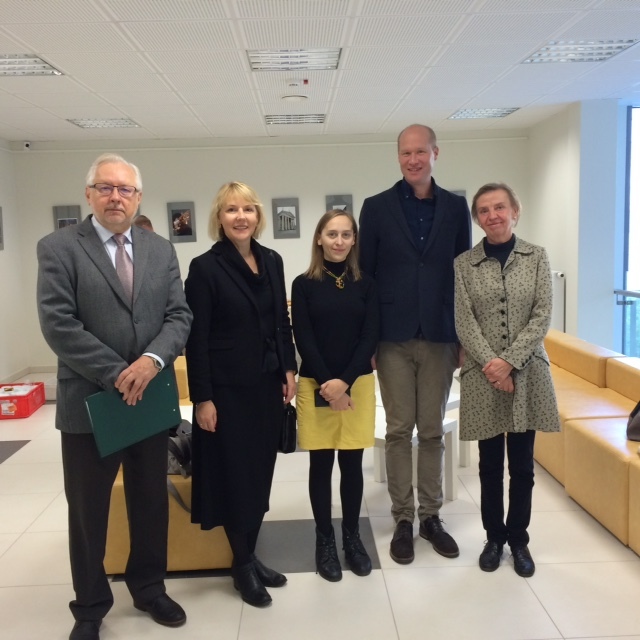 On October 8 – 9, The National Library of Lithuania, The Swedish Institute and Embassy of Sweden in Lithuania arranged a conference on children’s and young Adult Reading as challenge in the 21th century with emphasis on the importance of libraries. The conference was arranged in connection with a state visit to Vilnius by K H.M king Carl XVI Gustaf and H.M. Queen Silvia if Sweden. 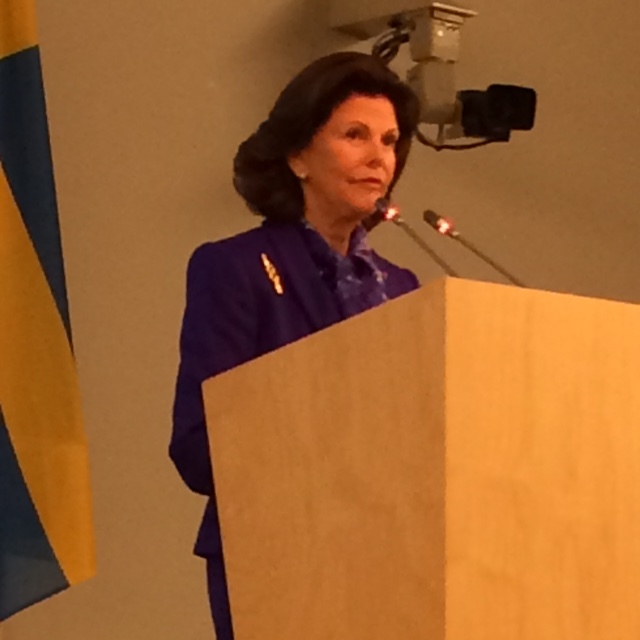 Queen Silva opened the conference by quoting Astrid Lindgren – Good Literature gives the child a place in the world and the world a place in the child and spoke on the importance of books for children – and for democracy in society. The writer and Sweden’s first reading ambassador Johan Unenge took part in a panel discussion titled Who forms the process of Children’s Literature with his Lithuanian colleagues Gintaré Adomaityté, Birute Marcinkeviciute and Renata Serelyté and the IBBY representatives Dr Kestutis Urba (Lithuania), Silvija Tretjakova ( Latvia) and Erik Titusson (Sweden) discussed mutual issues with Eglé Baliutaviciute, librarian and one of the organisers. Rita Elijosaityte, director of the organization Time to Read focused in her speech on the importance of involving parents in reading promotion and Aida Dobkeviciuté, Executive director of The Lithuanian Publishers Association gave a thorough presentation of the publishing business in Lithuania. Approx. 300 librarians, teachers and reading promoters attending the event, which gave food for thoughts to everyone. 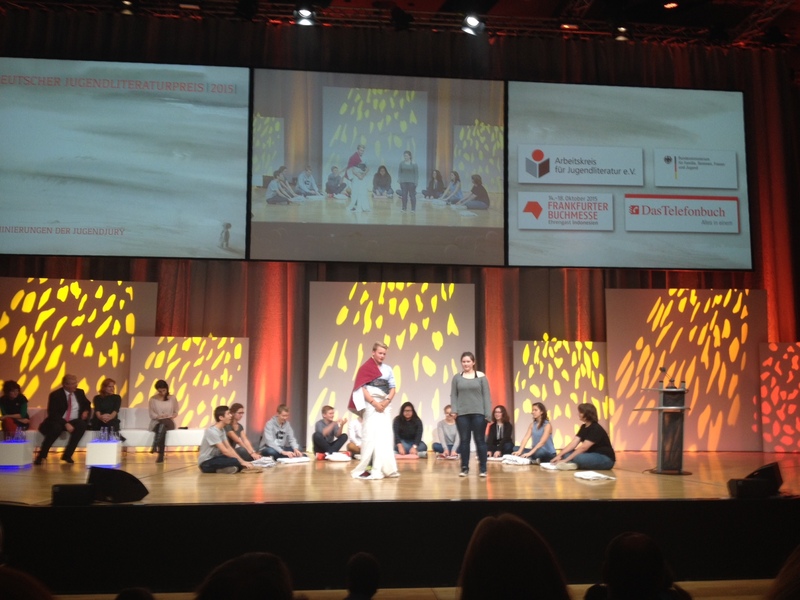 This week we´ll participate in the Conference Children’s and Young Adults’ Reading as Challenge in the 21st Century: Libraries Empower Social Changes 2015. The conference is arranged by the National Library of Lithuania, the Swedish Institute and the Embassy of Sweden and will be held at the Lithuanian Parliament. Among the speakers are Helen Sigeland, ALMA Director, Jonas Andersson, PhD in Comparative Literature, reading and reading promotion researcher at the Swedish Arts Council, Katti Hoflin, City Librarian, Stockholm Public Library and Erik Titusson, publisher at Lilla Piratförlaget and board member of IBBY Sweden. 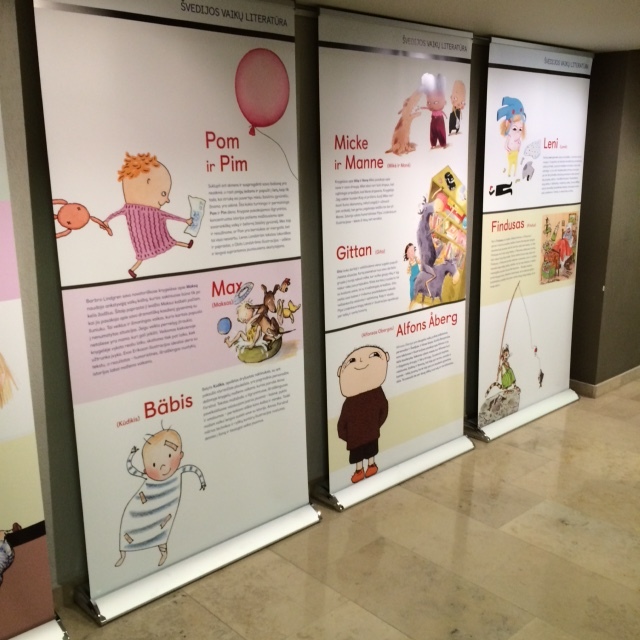 Two exhibitions will be presented in connection with the conference: The Most Popular Swedish Authors’ Books for Children (produced by the National Library of Lithuania) and Where Children Grow (produced by the Swedish Institute). Premiere today for the new Astrid Lindgren banknote! 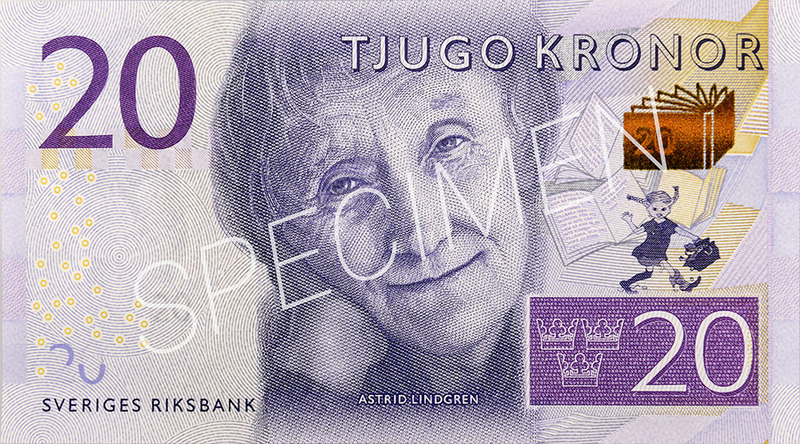 Today is the premiere for the new Swedish 20 SEK banknotes featuring Astrid Lindgren. 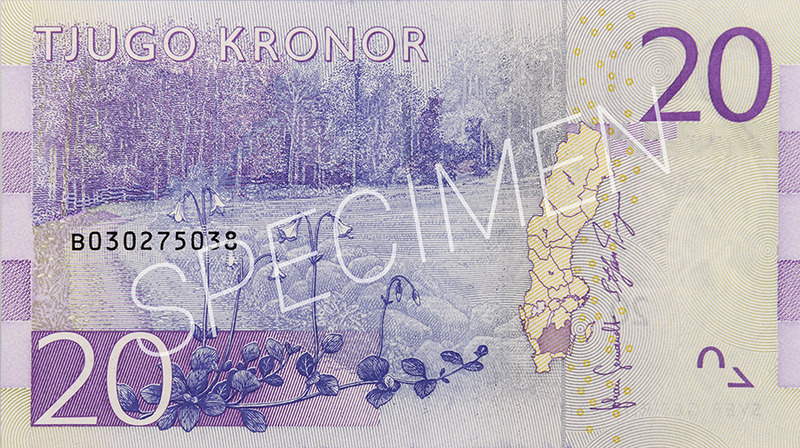 On the reverse side of the banknote, the county of Småland, where Astrid Lindgren grew up, is featured. “It’s very exciting that the new banknotes are finally here. We have been working together on this since 2008 with banks, retailers and cash-in-transit services. We hope that everyone in Sweden likes the new banknotes and finds them easy to pay with. We also hope that everyone is aware of the new security features and remembers to tilt the banknote to see that it is genuine,” says the Governor of the Riksbank, Stefan Ingves. From today, 1 October 2015, it will be possible to pay with the new 20-, 50- 200- and 1,000-krona banknotes. The present 20-, 50- and 1,000-krona banknotes will become invalid after 30 June 2016. The new banknotes are smaller than the current ones and have completely new motifs; the poet, composer and artist Evert Taube, film director Ingmar Bergman, the actress Greta Garbo, opera singer Birgit Nilsson and UN Secretary-General and Member of the Swedish Academy Dag Hammarskjöld.